I had intended to review both iRegatta and BC Racer. Both are excellent well done apps for smart phones and tablets. They include many features. For example, iRegatta can create polars from your sailing data. BC Racer has a nice wind shift indicator. But all I want is something to help me get to the line on time going fast in clear air. After testing iRegatta I wrote up a long review detailing the issues I had with the program. I then decided to test BC Racer as I had reason to believe it would perform better. However, I have decided not to review the programs themselves, but to talk about limitations on this class of device. Perhaps you can overcome these limitations but after reading this you will at leas know what they are. 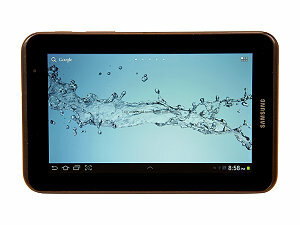 I tested these apps on a 7 inch tablet and a Nexus-One smart phone. 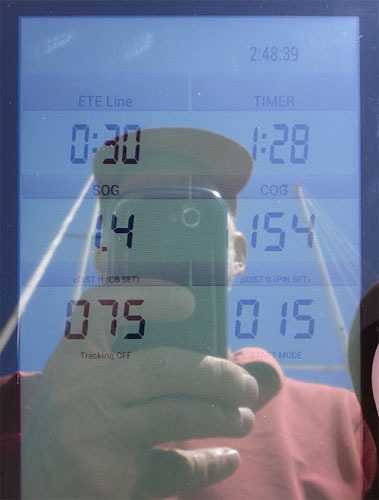 I used a purchased waterproof case for the tablet that allowed it to be hung in landscape mode on the bulkhead. For the smartphone, I used a zip lock bag. The waterproofing was not an issue. As much as I was convinced based on testing around my home that these devices were OK for daylight use, they are not OK surrounded by white paint and reflections off the water. It is just too bright. iRegatta fared the worst in this regard as some of the key buttons are very low contrast to begin with and almost impossible to see in daylight with these devices. The second issue was small print. BC Racer does a pretty good job of this but I found I needed to memorize the look of the start screen as it was impossible to read the label for the page. You might notice that the buttons that are used to set the pin and committee boat are not visible at all. That is really the way it is. I had to remember where they were and apparently I missed one. BC Racer was a little better. At least you could see the buttons. The problem of not being able to adequately read the screen along with almost no user feedback caused me to miss at least one of the two marks on each of these apps. I was 0 for 2 in the using it right scorecard. As I would want an app that I could set correctly almost all the time, this was really not acceptable. iRegatta was the worst in this regard. It is almost impossible to even see where the buttons are that set the CB and Pin. Pressing them makes them flash but your finger, perhaps with a glove on it, is covering the button that is flashing. I don't know why I set the pin end wrong but my guess is that I never set it and that it was holding some location on land from previous testing. BC Racer has feedback so I know I set the CB mark correctly. But I must have set it again by accident as it was about 100 feet off. I had great hopes that a tablet mounted forward of the cockpit would be a great idea. I bought the Galaxy Tab-2 7 mostly for this reason. But it turned out to be more or less the worst of both worlds. Too small with the smaller fonts to read from a distance and too big for crew to hold in their hand. The Nexus-One worked much better. Crew could hold it and read it (BC Racer is much more visible in daylight). From testing on land, both these programs do a good job of measuring the distance to the line or its extensions. This is all the well reviewed. Velocitec does say this should be enough. But I was most interested in time to the line as I am not that good at converting distance to time under the pressure of a start. That is the reason for having a time to the line app. 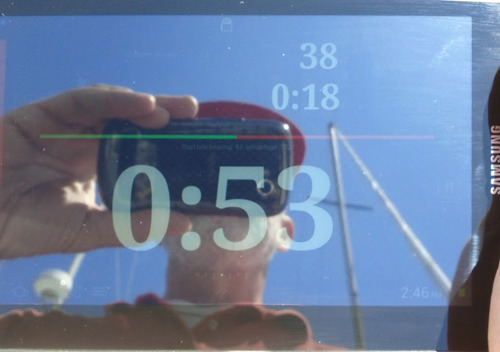 That said, if you are sailing dinghies and want to sit 40 feet from the line and harden up with 7 seconds to go to the start, distance may be just what you need. But if you are sailing a 36 foot boat that takes 60 seconds to get up to speed and uses up 85 feet to turn, it would be really nice to know when it is time to go full speed for the line. As the literature on Velocitec says, this function just doesn't work in the real world. You can't just sail toward the line right on time and see the numbers for time to start and time to line agree. If you are late, you can't make it up. If you are early, you need to kill some time. But as soon as you change course to kill time, the time to line functions give wildly different readings as you are no longer heading to the line. Turn far enough and it will tell you you cannot get to the line at all even though turning back and heading to the line at that point would make you early. This is our last start and one I have done a fair amount of analysis on. We were right on the line at the gun after sailing down it toward the pin because we got to the line about 5 seconds early. Not a bad start, but not what we wanted. This track is the 5 minute period up to the gun. We are right on the line at the gun. The calculation is that we were 1/2 inch off but we set our line a bit on the starting side of the line so were not over early. Hey, I know the accuracy is not to 1/2 inch but that is what the number was! The graph below shows the theoretical readout difference between a time to the line readout and the time left readout during the last minute of the pre-start. This is not a readout that any of the apps offer but it helps to analyze the data this way. There are three lines. Algorithm 1 is the most likely algorithm that a developer would use. 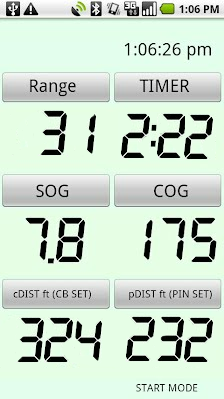 It calculates the speed from two GPS readings and extrapolates that given the heading and location of the line to come up with the time left. Algorithm 2 is the improved one I gave to iRegatta and what they implemented in 2.90. The third one, "New Method", is one I hope to see someone implement. I have tested it using this real GPS data but it is not coded into any device yet. It would probably be a new app rather than a simple algorithm change. What all three of these show is that we were early. We killed some time and then headed to the line. We were still early so if you look closely you will see that at 5 seconds, we were about 3 seconds early, at 2 seconds, about 2 seconds early. What we were doing is reaching down the line, running parallel with it about a boat width (our setting offset) away. My point is that it would be more useful to know how long it would take you to get to the line all during the pre-start and not just when you are heading toward the line at a constant rate and heading. Let me assume I had a device or app with a readout of seconds early or late. How would I use it? I would sail around back from the line until it said I was early by the amount of time it would take me to turn the boat toward the line and get to speed, less my bow offset, and safety margin. Say I want to be 6 seconds late, allowing 3 seconds for bow offset and 3 seconds for safety. Say I allow 6 seconds to get the boat pointed to the line. In that case, I would head to the line at 0 seconds late. As I approach the line perhaps I see that I am showing 4 seconds late rather than the 6 I want. I head up briefly then back and see I am now at my target 6 seconds. Wouldn't that be sweet? Let me know what you think.